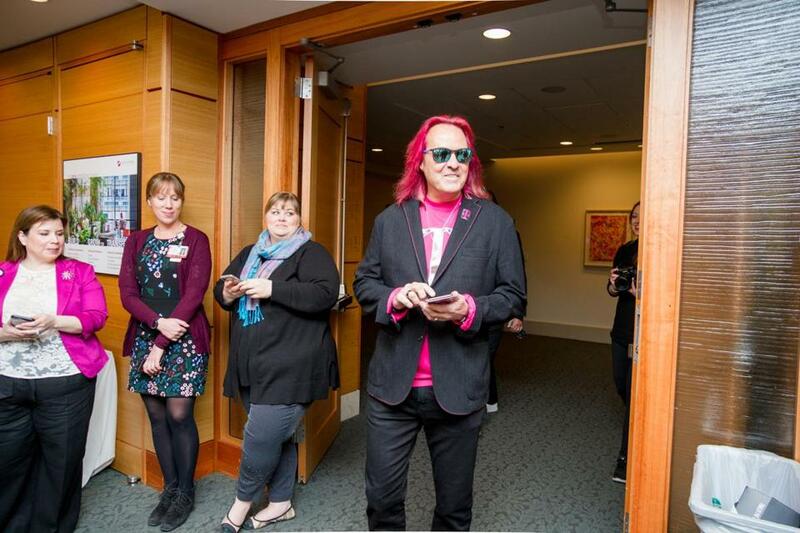 CEO John Legere, his hair colored T-Mobile’s magenta, presented a $4.5 million check to Dana-Farber Cancer Institute last month. Congrats to Boston Marathon champions Lawrence Cherono and Worknesh Degefa. Amazing races. But I want to tell you a story about another big Marathon winner: Dana-Farber Cancer Institute. It’s a tale about a renowned researcher, a prominent CEO, and magenta hair (lots of it, actually). It’s also a story about how the Marathon brings together strangers, sometimes bonding them in unlikely ways. Dana-Farber chief scientific officer Dr. Barrett Rollins and T-Mobile US CEO John Legere first connected 15 years ago, sharing a love of running and a passion for fighting cancer. Their chance meeting turned into quite a fruitful friendship. They first got to talking while warming up in a church near the Hopkinton starting line in 2004, both of them there to raise money for Dana-Farber. (Legere, a Fitchburg native, is a lifelong runner: He ran track and cross-country during his undergrad years at UMass Amherst, and he says he still runs multiple times each week.) Legere led Global Crossing at the time. He hadn’t yet grown his hair long or started wearing loud magenta shirts, like he does now at T-Mobile. After he finished that year, Legere says he kept thinking, “What more can I do to help?” He returned to Hopkinton — some 11 times, in fact — to raise money for Dana-Farber, becoming one of the hospital’s most prolific benefactors. (Rollins says Legere was often fast enough that he didn’t need a charity number to get in, but he ran for Dana-Farber anyway.) Legere eventually joined the hospital’s board, in 2012. Time takes its toll, as it often does. Both men scaled back their running ambitions in recent years. Legere says he needed to focus on, as he puts it, “leading the Un-carrier revolution at T-Mobile.” The kid from Fitchburg grew out his hair and developed a showy persona in that role, eventually racking up more than 6 million followers on Twitter. Rollins started encouraging Legere to put that social media power to use for Dana-Farber. Finally, Legere figured out a way to pull it off. He issued a dare to his followers: Collectively give $1 million to Dana-Farber by the end of December, and I’ll personally match every dollar up to $1 million and dye my hair magenta for a week. Legere’s followers sure came through. By January, it was clear that Legere would blow past his goal. But he wasn’t about to stop and color his hair just yet — maybe because he had a congressional hearing coming up, concerning the T-Mobile-Sprint merger. Magenta hair might not fly on Capitol Hill. So Legere kept raising money. Eventually, he hit $3.5 million, plus his $1 million match. More than enough. Legere made plans to travel to Boston, dyed hair and all, to celebrate. The money will go to the Profile project, which involves analyzing the DNA found in tumor tissue from patients at Dana-Farber and Brigham and Women’s. Rollins helps lead the effort. On March 27, Legere visited Dana-Farber to celebrate. He worked the crowd. Dana-Farber execs joined Legere to reveal the $4.5 million total. Then he took off, as Rollins puts it, like a superhero. Legere wasn’t one of them this time, but he still wants to get back to Hopkinton someday. The lure is strong. The dream is real. Maybe it’s beating the world’s fastest runners, or maybe it's just surviving 26.2 miles. Raising millions for cancer research. Pulling off a major corporate merger. Or simply dying your hair a wacky color. The Marathon reminds us that there’s no need to wait to pursue a bold goal, or a crazy one. Just lace up your shoes and get out there.